Royale 500 Casino will then reward you with a bonus (Welcome Bonus is for new players only). The terms and conditions of the bonuses vary between different casinos and might also change over time and between different countries, so it is important to compare the different offers and read the T&C for Royale 500 Casino before signing up. Royale500 casino has started off with the ambition of becoming the world’s largest gambling platform in the industry – the operator, Titanium Brace Marketing Brace Ltd is on the right path of accomplishing the goal, with their Malta Gaming Authority license, great gaming selection, 24/7 customer support and, probably the most important factor of all, their safety and game fairness standards which include monthly reviewed RNG software and 128-bit encryption technology. As an instant casino, Royale500 does not require absolutely any downloads or additional system set-up. All you need to do is launch the casino from any device and complete the registration process, which will qualify you to claim the casino’s welcome offer – 100% deposit match and free spins. 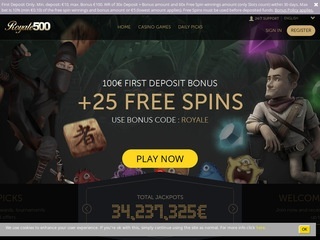 As already mentioned above, Royale500 has a simple layout that will allow you to go through the offer and explore the gaming categories without any difficulties – even if you are not, what one may call, a proficient and savvy computer user. 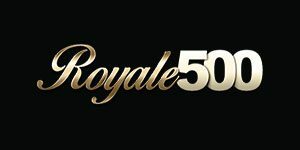 The design of the website indicates the Royale500 is not targeting any group in particular and that the venue is equally suitable for different demographics. The games are placed under several categories – Slots, Jackpot, Blackjack, Roulette and Live Dealer and the user can filter them according to the release date, popularity or one of 20 providers powering Royale500, the most dominant (in terms of the number of games featured on the website) being: Microgaming, Play N Go, Evolution and Merkur. The majority of offer consists of slots, which you can play in real cash and free play mode. You will notice that each of the games comes with a brief description that contains basic information about the game structure (number of reels and paylines) betting limits, total payout, screenshots, bonus features and the name of the developer. Favorite games can be bookmarked and stored for later and if you would like to see what other people enjoy playing, you can always go straight to the Most Popular section, where releases such as Vikings Go Berzerk, Viking Runecraft and Immortal Romance are found. Both Roulette and Blackjack are placed under separate categories, where you will come across Live Dealer and animated variants for each of the two games. Almost all of the Blackjack games are Live, with only a couple of video versions that have adjustable betting limits enabling the players to launch them in Standard, High Rollers and VIP mode. Roulette has a larger number of animated table versions – around 10 at the moment – with the same choices of betting range. Although this category is usually restricted to Keno, Bingo and Scratchcard games, Royale500 also includes Progressive Jackpots, Baccarat, Punto Banco, Pai Go, Casino War, Video Poker and Double Heaven under Other Games section. Live Dealer offer is quite impressive as it provides the games from two extremely strong developers, Evolution and NetEnt. Accessing this category is only possible for the casino members and as soon as you open your Royale500 account and place your first deposit, you will be able to join one of Poker, Blackjack, Roulette and Baccarat tables or try your luck on the Wheel of Fortune. To place their deposits, the members can use their Visa, Maestro and MasterCard debit or credit cards, EntroPay, Skrill, Neteller, EcoPayz, ePro or Wire Transfer. The fee will depend on the selected method and it ranges from 2.5% to 5%. The minimum deposit amount is 10 EUR/USD/GBP/AUD/CHF/CAD but the players can also set up their own limits. The available methods for depositing and withdrawals will be determined by your location – the minimum that can be pulled out from your cashier to your personal account is 20 EUR/USD/GBP/AUD/CHF/CAD, while the maximum is 5,000. There will be no fees applied to the withdrawals and the processing time is 2 to 7 working days (if you are using cards or wire transfer) or instant for Neteller, Skrill, Paysafecard or Webmoney. Royale500 offers both email and live chat support. If there is anything that you need to know, click on the support button and you will be connected to the first available agent in no time – should there be no free representatives to assist you, an online form can be submitted, along with the relevant user details and the question that you need to be answered. Customer service is provided in other languages as well, although 24/7 service is offered only in English for the moment.